Fiction · Gwen B · In the Library · Page-Turner · Quick Read! Following the #4 New York Times bestseller The Road to Grace, Richard Paul Evans’s hero Alan Christoffersen faces a life-changing crisis on his journey to grace. After the death of his beloved wife, after the loss of his advertising business to his once-trusted partner, after bankruptcy forced him from his home, Alan Christoffersen is a broken man. Leaving everything he knows, he sets out on an extraordinary cross-country journey; with only the pack on his back, he is walking from Seattle to Key West—the end of the map. Along the way, Alan begins to heal, meeting people who teach him lessons about love, sacrifice, and forgiveness. But in St. Louis, Alan faces another life-changing crisis, and now the journey is in jeopardy. I couldn’t wait to read the 4th book of this series. It was well worth the wait, let me tell you! It was also cool to see that St. Louis was a part of his journey. I didn’t want the story to end. Thank God there will be another one coming 🙂 Richard Paul Evans has tugged at my heart again with A Step of Faith, the latest installment of his amazing “The Walk” series. Alan heads from St. Louis through the deep South tasting the culture and amazing food along the way. He meets some very interesting people including an encounter with a “religion” he never expected. All of them have Alan pondering what he really needs and wants most. When Alan comes to the realization about what to do, he hits another speed bump in his path. I read this book quickly and could not put it down. 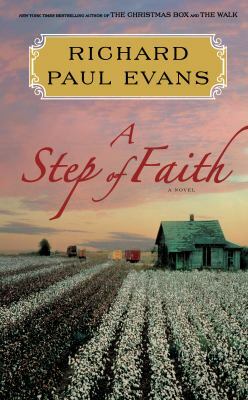 Mr. Evans is an incredible storyteller and this book is the best one of this series, yet! Now begins the agonizing wait for the final part of this incredible adventure which is due out next year. “The Walk” series puts readers through an emotional wringer and we are better for the ride. It started out with The Walk and now after many Miles to Go down The Road to Grace take A Step of Faith and join the journey. Life’s road will never look the same. I have read each of “The Walk” Series books as they came out. I am curious how this trip is going to end since A Step of Faith had a surprise ending! All of Richard Paul Evans books are inspiring and heartfelt and this book is no different. I can’t tell you how much I’m looking forward to the next one! My only complaint with this book is that it is to be continued. Ironically, that is also a blessing because it means at least one more book in this wonderful series! I definitely recommend reading this series. It was good for my soul. It will leave you with deep thoughts about the journey we’re all taking and where life will lead us. I would so love to see it turned into a movie. It would be great! Hugh and Elle are enjoying their newly married status but, like any newly married couple, are struggling to agree on a few aspects of their new lives together. After a particularly intense fight over Elle’s flying schedule, Elle returns home to find Hugh missing and rumors about people walking around at night surrounded by a strange ticking noise. Elle now has to use her powers as the Oracle to track down Hugh with the help of Loisa, a Nightwalker. Throughout Elle’s search, she meets new friends and enemies and discovers the mystery of Hugh’s disappearance and the clockwork zombies are more intertwined then she expected. 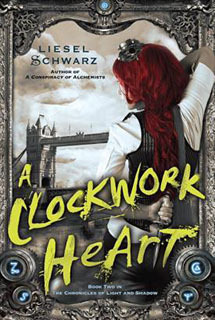 This is the second book in The Chronicles of Light and Shadow series and although it has a slower pace in the beginning, I really enjoyed the ending and the different Steampunk characters that Schwarz introduces. I’m glad that Hugh’s character had a backseat role this time around because that gave way for other characters to develop, like Loisa. I also liked that Schwarz showed that Elle didn’t need Hugh to be a strong heroine and that she’s a little more independent then I originally thought. I wasn’t super excited to read the second book in the series but with the surprise ending, I can’t wait for the next installment, Sky Pirates, coming out next year! When the residents of Sterling woke up on a cold March morning, they had no idea Peter Houghton would change their town forever. Peter has been the victim of bullying since his first day of kindergarten. He endured years of torment that led him to lashing out in an unthinkable violent way. One of Peter’s victims is the boyfriend of Josie Cormier, who used to be friends with Peter when they were young. Josie decided to abandon Peter when she thought it would be easier for her social status to rise without him. Now Josie and Peter must face the consequences that their actions have had on one another. This was an interesting book to read for the second time. The first time I picked it up was in 2007, right after it was published. Since then, there have been multiple school shootings, including the tragedies at Virginia Tech and Sandy Hook. I’m not sure if I was a little too young to completely understand what happened at Columbine but this time around, the read seemed more intense and life-like. Maybe this was because those shootings happened when I was more understanding of what was happening in the world. Picoult has a great ability to take current events and display the issues from both sides of the spectrum. In Nineteen Minutes, Picoult covered the victims of the shooting trying to move on with their lives and Peter as the victim of bullying that led up to the shooting. 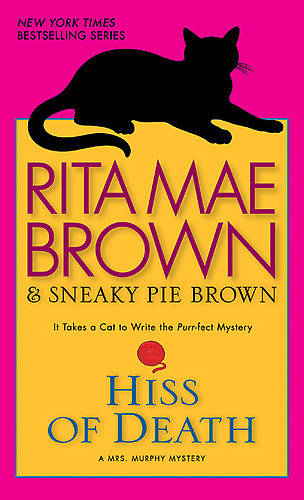 Hiss of Death by Rita Mae Brown and feline co-author, Sneaky Pie Brown, is the 20th book in the Mrs. Murphy Mystery series. In Hiss of Death, our heroine, Harry, is diagnosed with stage 1 breast cancer. As Harry is being diagnosed and treated for the disease, professionals from the hospital where she is being treated start dying. First, there was the OR nurse who may or may not have died from a hornet sting. The next two deaths are definitely murder. Harry being Harry feels the need to solve this murder mystery. The Mrs. Murphy Mystery series is set in Crozet in central Virginia. Harry lives on a farm with her veterinarian husband (Fair), her Corgi (Tee Tucker), and her two cats (Mrs. Murphy and a Pewter). The Corgi and the two cats help Harry solve her mysteries. I hadn’t read a Mrs. Murphy Mystery for a few years so I decided to read Hiss of Death to see what Harry and the cast of characters in this series was up to these days. I didn’t enjoy this book as much as I enjoyed the earlier books. The animals didn’t seem to be as much help in solving the mystery. Or maybe it was the weighty subject of breast cancer that permeated the book. If you’ve read other books in this series, I would read this one. If you want to start reading this series, I’d start with one of the earlier books. Annabelle is revamping her grandmother’s matchmaking business. She’s hoping to get a high profile client so she can establish her presence in Chicago. Thanks to the fact that her friend’s husband is a client of one of Chicago’s most famous sports agents Annabelle finds herself with an “in” as she gets a meeting with The Python, otherwise known as Heath Champion. Heath is ready to settle down and get married. He has a timeline and he intends to follow it – this is just the next thing he’s ready to “accomplish.” Heath knows what he wants in a woman: beauty, intelligence, patience (she has to deal with a lot of high-maintenance athletes), and a good pedigree. 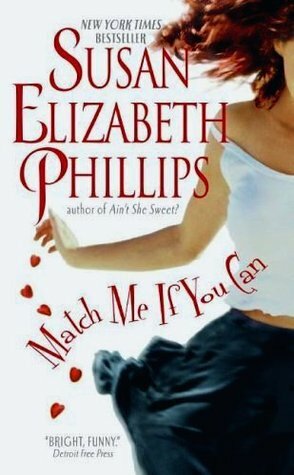 Annabelle is willing to do whatever it takes to try and make Heath’s match happen, but she has no problem putting him in line when she tries to explain that it’s not as simple as making a list and finding the girl. Will Annabelle ever be able to find a successful match for Heath? Will Heath ever be able to realize that if he wants to be in a relationship he’ll have to put his work second? The semester is just getting under way and I’m in the mood for light, fun reads so I have lots of romance novels sitting at home, compliments of the library. 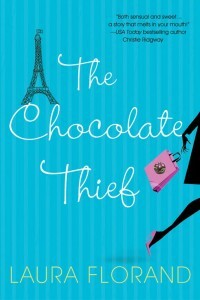 The Chocolate Thief revolves around Cade Corey, heiress to the Corey Chocolate fortune in the United States, as she attempts to convince one of Paris’s top chocolatiers (Sylvain Marquis) to collaborate on a chocolate with her under the Corey name. Sylvain would never think of debasing himself in such a way and he has no qualms in letting Cade know that he considers her family’s chocolate to be beneath him. The two immediately get under each other’s skin – but there is also a considerable amount of sexual chemistry. Cade’s grandfather started the Corey Chocolate business and he was always eager to learn the secrets of European chocolatiers so when he was younger he tried to steal them. Cade can’t help but let her grandfather’s efforts guide her when she makes the decision to break in to Sylvain’s chocolate shop. She leaves considerable evidence behind since she couldn’t keep from snacking while she searched for recipes. When Sylvain realizes what has happened he’s both infuriated and slightly turned on. Cade and Sylvain play a sort of cat and mouse game as she tries to figure out a way to make her dream of a luxury chocolate line come true and he tries to resist Cade’s sexual pull. I enjoyed this read, but not as much as I thought I would given that it combined romance with food, one of my favorite things to read about. I might give more of Florand’s books a try, though. 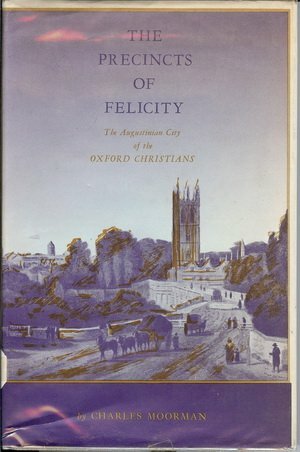 There is plenty of literature available on the Oxford literary group known as The Inklings, but this is one title that you would really have to do some digging to come across. I happened to find it while looking for more resources on Charles Williams, one of the members of the group. Moorman’s book traces the themes of Augustine’s Civitas Dei (City of God) and Civitas Terrena (City of Man), discussed in the theological classic City of God, through the writings of Charles Williams, C. S. Lewis, J. R. R. Tolkien, T. S. Eliot, and Dorothy Sayers. Moorman clearly sees Charles Williams as the center of this literary circle. This is certainly debatable, but Moorman does a good job of making his case. It is certainly the case that it is in Williams’ writings that the “City” plays the largest thematic role. Moorman does an excellent job drawing out the less obvious ways that this theme is used by the other writers as well. It was particularly helpful to see the way that the “City” plays a major role in Tolkien’s The Lord of the Rings, especially given that it is his emphasis on the pastoral, the rural, and the natural for which Tolkien is most commonly noted. The chapter on Tolkien alone ensures that what otherwise might be a dated study remains relevant given the continued scholarly interest in Tolkien and the neglect of this particular theme in his work.